If you want to bring a car then you must either take the Stena Line ferry Harwich - Hook of Holland or the DFDS ferry from Harwich to Esbjerg in Denmark. In either case you then have to take another ferry from Denmark to Norway - there are several services run by Color Line and Fjord Line. DFDS Seaways operates the Harwich - Esbjerg route, with 3 return journeys per week. From Esbjerg it is around 3 hours drive to northern Denmark for the next ferry. Stena line operates 2 brand new (Autumn 2009) ferries per day between Harwich and Hoek van Holland. It is then a long drive through Holland, Germany and Denmark to Hirtshals in northern Denmark for the next ferry. The ferry is much shorter and cheaper than the DFDS route, however. 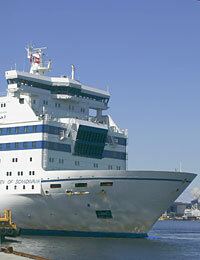 There are several ferries between Denamrk and Norway, with fast new services between Hirtshals Denamrk and Kristiansand (Superspeed 1) and between Hirtshals and Larvik (Superspeed 2). Fjord line operates 2 ferries between Hirtshals and Stavanger (Tananger) and Bergen.